How to Get from Lisbon Airport to Setubal? If you are visiting Setubal your best option is arriving at Lisbon Airport. Once there, unless you know someone in the area you will certainly need a transport to Setubal. We do not advise public bus from Lisbon airport to Setubal as you have to switch between multiple lines and will take forever. To avoid all this hassle of buses and switching lines your best option is to book online a Lisbon airport transfer to Setubal. We provide a direct private transfer straight from Lisbon airport to your final destination. Select Setubal as your transfer destination area and provide us with flight details, Setubal accommodation address and contact. We automatically process your request for transport availability to Setubal and send a booking voucher with your transfer confirmation in a matter of seconds. At Lisbon Airport arrivals terminal a friendly driver will be waiting for you next to a placard with our website logo. For the return transfer we will pick you up from the same address in Setubal. And remember, you can always pay later to the driver for both your arrival and return Setubal transfer. How far is Setubal from Lisbon Airport? How much will it cost? How long? The travel distance between Lisbon Airport and Setubal is 48Km and transfer time takes approximatly 35mins under normal traffic conditions. Providing private non-stop airport transfers to your final destination. Our private Lisbon taxi transfers to Setubal have fixed rates and are the faster, affordable and hassle free alternative transport to Setubal. A well identified driver will meet and greet you at Lisbon Airport arrivals hall, he will help you with your luggage and guide you to your assigned airport transfer vehicle. Our vehicle fleet covers all group sizes - executive saloon or estate car for up to 4 passengers, modern people carrier van or mini-bus up to 16 passengers or even a large bus up to 27 passengers. In approximately 35 minutes you will be relaxing at your Setubal resort, hotel or private villa. Welcome to Portugal! Portugal well known city, Setubal is located at 48km south Lisbon on the north bank of Sado river. 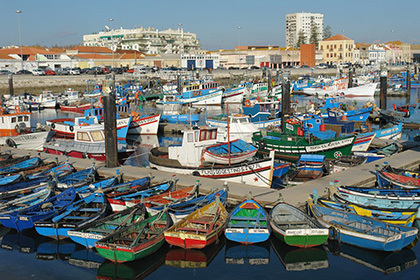 Setubal is an important center of the portuguese fishing industry. Tourism is another alternative for the region since the nearby coast of the Arrábida park offers beautiful beaches and unspoiled natural nature spots. Dolphins still inhabit the Sado river which is the only river in Portugal running from south towards north. On the south bank lies the peninsula of Troia where you will find holiday apartments, golf resorts and luxury hotels. We are specialists in private transfers service at Lisbon Airport. We will transport you directly to and from any resort, hotel or private holiday villas / apartments in the Setubal and Troia area. Pre-book now your airport taxi transfer from Lisbon airport to Setubal, check out our complete list of fares & prices and if you cannot find your destination request us for a custom quote.